This is June's Birthstone, Pearl. It's stitched using Soie D'Alger (with a DMC conversion included), Swarovski Crystal Pearls and Delica beads (conversions included). I love how this one stitched up, there are a lot of eyelets, and while they're not hard, they can be a bit tedious. They really add a great texture though, and the little pearls are so elegant looking - I think I might like them better than the bicones! Also... with all the models I've got stacked up to stitch for release over the next year (about 20) and all the stuff I've already got started in Patternmaker (32!!) I've started designing something else new. Depending on how quickly I get it charted, I may sneak this one in this year. It's a companion piece to Twisted Band Sampler. Not sure what I'll be calling it, but I was inspired when I saw Eileen's colour selection for her Twisted Band in her own silk threads. Seriously, how could I resist? The thread pack is available from Eileen, though I don't yet see it on her website, Thread Pickerz Silkz, you can contact her through the site. :) And of course seeing the photo on black - well you guessed it, I'll be designing the new one for black fabric (though it will look gorgeous one white as well). 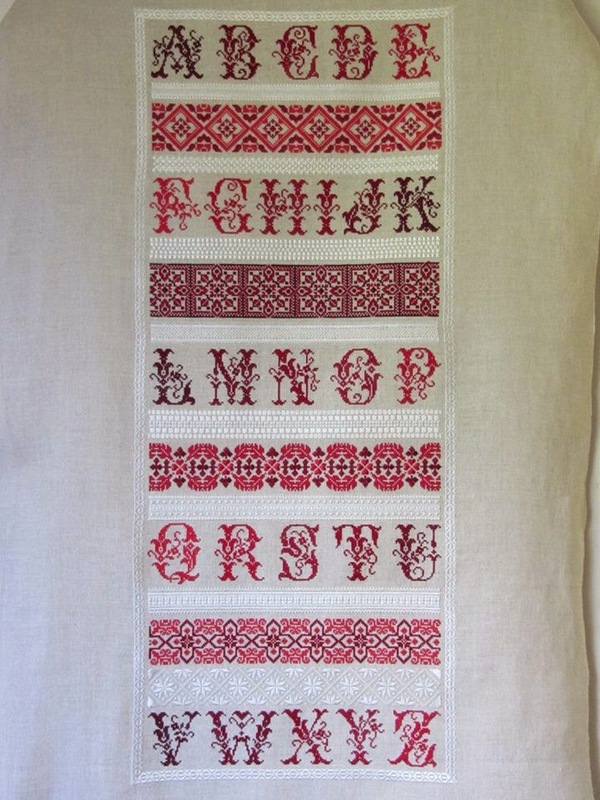 And finally, Marjan has already finished her Learning Sampler! She's been working ahead of the rest of the group, and sent me the pictures this morning. 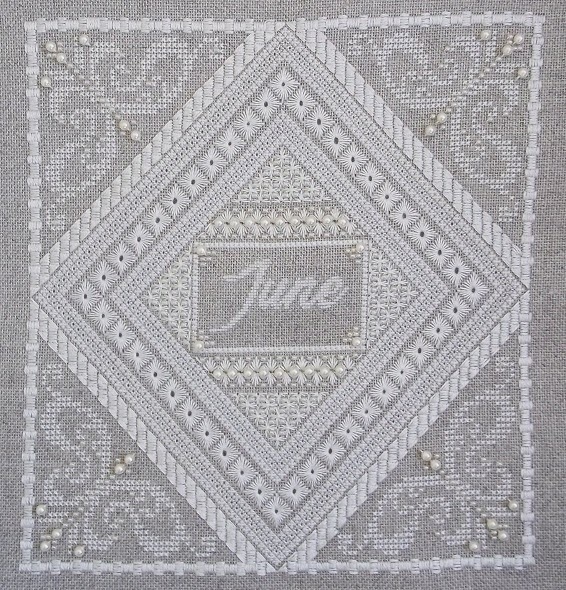 She stitched this on 40ct linen, using the recommended Silk Mill colours (the same ones I'm using for mine). It turned out beautifully. I'm not even finished my own yet, so this is the first I've seen it completed!! And now that I'm all caught up on work stuff for the day, I think I may go stitch for a while. I just started Shades of Rose last night and I'm loving it already - the colours are just yummy! The floss is obviously Dinky Dyes, the fabric is from Hand Dyed Fabrics by Stephanie called Elizabeth and it's a lovely pale pink! One last note today - one of the main reasons I haven't been keeping my blog updated regularly is because it's just not getting any traffic anymore. The only comments I've had in months are the hundreds of spam comments I have to delete every day. I'm debating whether to discontinue it and just continue these updates on Facebook alone. I'm hoping to have time to get my own website set up over the summer, so I may hang onto it until then. Hi Nicole, I do enjoy reading your blog. Although I am not stitching any of your projects I love to look. Go Marjan! As for the spam comments...do you have the number generator enabled in the settings for blogger for your post/comments as this could disable some of the what seems like 'computer generated spam'. Rae. I love reading your blog, but mainly use it for reference for materials lists etc. I find I use FB to catch up with your news and comment on all your up and coming and new designs! I also love your blog (though I'll admit I've been bad about checking the blogs I follow lately, as well as very bad with posting to my own!) I definitely understand the time it takes to post all the pics and information to your blog, and I'd be lying if I said I'd rather you devote your designing/stitching time to writing your blog! As long as you plan to post all your wonderful info on your Facebook page, I know I'll be happy. The bottom line is that you must be happy and not overly STRESSED with blogging when it seems to interfere with your designing and passion for stitching. VERY excited about your news regarding the companion to Twisted Band Sampler (love Eileen's silks!) and the Rose colors you chose for your next "Shades of ..." project are beautiful as well. Can't wait to see your future creations and add them to my ever-growing Northern Expressions stash! !